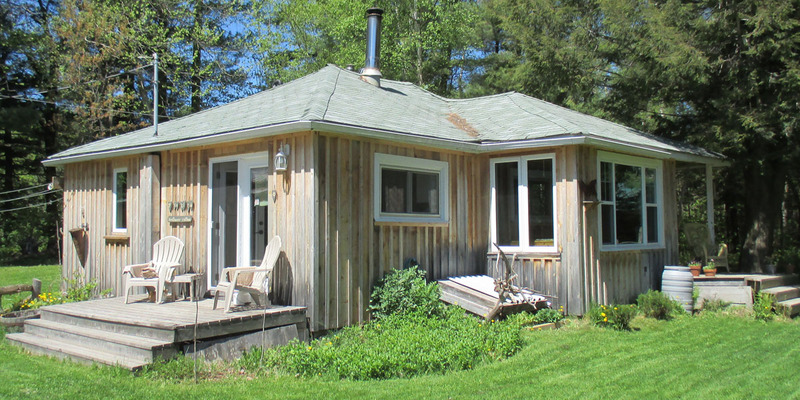 Set-back amongst ancient pines, the bright and sunny Birdhouse Cottage is a peaceful place. The Birdhouse Cottage is very private. It has a bright, full (vegan) kitchen. From $165/night -- The Birdhouse Cottage is where Piebird merges the North with a little bit of the West Coast. The driftwood inspired, earthy richness of our previous home on the BC coast influences much of what we do here. You'll completely love the cottage's bright openness. There are two bedrooms with luxurious beds, claw-foot bathtub and full vegan kitchen. We put in so many windows that there is a marvellous view from every angle so you always know what's happening outside — whether there are goat-friends in the garden, duck-friends at the door, a big Ontario Sun in the sky, or the clouds are putting on a puppet show. (2019 bookings from mid-May to September) The Birdhouse Cottage is also home to several resident cats who will greet you and welcome you to their home. They will insist that you build them forts out of blankets. Booking for the 2019 season opens mid-May. If your vision of a perfect getaway is to participate in creating a peaceful change in the world and to share all the joys this life offers, then Piebird might be the place for you! You can rest well knowing that your stay supports something meaningful: Sanctuary. When you explore down the hill behind the cottage, you'll find the funky hand built sauna and a well-loved canoe by the creek. From there, a tamarack boardwalk weaves it's way through the forest, leading eventually to the common-house, it's a fun way to get there! The Birdhouse Cottage has it's own laneway in from the road, past the pastures and back to the big pines at the back of the property. It's very private and very you!